Based on P’ungmul (traditional Korean music) Samulnori, literally translated to mean play of four objects, is a contemporary rearrangement aimed to fit the western concept of concert halls. Samulnori consists of four instruments, Kkwaenggwari, Janggu, Buk, and Jing. The rhythms in Utdari Samulnori originated from the Pyongtek music which came from the Utdari region of the Gyonggi province of Korea. This piece is also taught in our Fall semester Decal class! P'angut is another part of P'ungmul that incorporates drumming, dancing, and singing to capture the community-centered and agricultural essence of Korean society in the past. It incorporates a variety of instruments, including Kkwaenggwari, janggu, Buk, Jing, and Taepyeongso. It is a very free-spirited piece that embodies a sense of cathartic release where performer-audience interaction (like dancing along to the music or making encouraging calls) is not only allowed, but highly encouraged! This piece is taught in our Spring semester Decal class! YoungNam Samulnori follows the same concept as Utari Samulnori in the sense that they are both played indoors and with four different instruments. It is another variation of Samulnori whose rhythms originated from the Jinju Samchonpo music which came from the YoungNam region of the Kyungsang province Korea. This piece adopts a jazzy arrangement with the ability to draw in the audience with its fun rhythms. Played on mounted standing buks, waebuk encompasses using two chae’s (sticks) to play different rhythms, different from the buk that you may be able to observe from Samulnori and Pangut. Players will utilize ogeum (way of keeping the beat with your body) to play the mounted buks to not only match the sounds but also the movements of each players, as players’ distance from the buks play a vital role to the aesthetic part of playing Waebuk. Talchum performers wear masks and long-sleeved robes and utilize song, dance, and satire to convey lower class frustration with the rigid social hierarchy of old Korean culture and the upper class. Throughout much of the piece, performers bellow a phrase that roughly translates to "The mountains are good, the water is good, all is good!" Hwimori SunBan Suljanggu, or Standing Suljanggu, is a more intricate piece focused on the rhythmic complexity of the Jangu. This piece follows the Hwimori rhythm and arrangement which is considered to be one of the fastest and the more energetic rhythms in Pungmul. Players tightly strap the Janggu to their bodies to allow for a wide range of movement and fluidity. Suljanggu embodies Ogeum, rhythmic precision, and the powerful unification of man and drum. Samdo Sitting Suljanggu is similar to Hwimori Standing Suljanggu, but with more rhythmic diversity and complexity. The rhythms for this piece originated from three regions of Korea, and while the rhythms were mostly played outdoors and standing up, this piece was arranged and modified to be played sitting down and indoors. This dancing percussion piece relies on the precise coordination of buk players. The choreography involves a lot of fast and heavy movements, leading to a very dynamic and energetic performance. 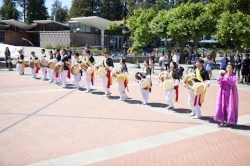 Chwi-ta-dae, or Gilgut, is the marching band of traditional Korean culture. It includes base beats provided by a Buk-like drum (용고), the bellowing sounds of horns (나발), the clashing of cymbals (자바라), the high-pitched ting-tings of the oonla (운라), and all the instruments in P'angut.